Manipulation under anaesthesia (MUA) is a non-invasive procedure increasingly offered for acute and chronic conditions, including:neck pain, back pain, joint pain, muscle spasm, shortened muscles, fibrous adhesions & long term pain syndromes. Manipulation under anaesthesia is generally considered safe and is utilized to treat pain arising from the cervical, thoracic and lumbar spine as well as the sacroiliac and pelvic regions. 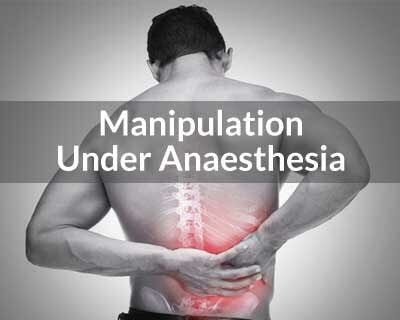 Manipulation under anaesthesia uses a combination of specific short-lever spinal manipulations, passive stretches and specific articular and postural kinaesthetic manoeuvres in order to break up fibrous adhesions and scar tissue around the spine and surrounding tissue. In 2014, the Chiropractic and manual therapies Guideline-practice and performance of manipulation under anaesthesia was published. See the original guideline document for information about the factors that qualify a patient for clinical candidacy for MUA. Every condition treated must be diagnosed and justified by clinical documentation in order to establish medical necessity. Documentation of the patient’s progress and the patient’s response to treatment are combined to confirm the working diagnosis. See the original guideline document for information about the diagnoses that are most responsive to MUA. A treatment plan of three consecutive days of treatment is recommended, on the rationale that serial procedures allow a gentler yet effective treatment plan with better control of bio mechanical force resulting in increased safety, and more focused and effective subsequent procedures after monitoring the effects of those administered previously. Ranges of motion should always be measured after an appropriate warm-up period for consistency and as recommended within the American Medical Association Impairment Guidelines. Single spinal MUA is most often recommended for younger patients; when the area to be treated has not been previously injured; and when the verifiable global and inter segmental motion restrictions are relatively mild. Single spinal MUA is most often recommended when conservative care has been rendered for a sufficient time (usually a 4-6 week minimum) and the patient’s activities of daily living or work activities are interrupted in such a fashion as to warrant a more aggressive approach. If the patient is treated for intractable pain with a single MUA procedure and responds with 80% symptomatic and functional resolution, the necessity for future MUAs should be considered and depends in part on the objective parameters determined during and after the MUA procedures. Serial MUA is recommended when the patient’s condition is chronic and when conservative care as described in this guideline has been rendered. Serial MUA is recommended when the injury is recurrent in nature and fibrotic tissue and articular fixation prevents a single MUA from being optimally effective. No further manipulation should be required. May add proprioceptive neuro facilitation protocols. These can be incorporated during stretching if tolerated. Treatment frequency during the first week should be 3-4 days dependent on the individual patient’s needs. These follow-up procedures should include all fibrosis release and manipulative procedures performed during the MUA procedure to help prevent re-adhesion. Continue full protocols to include fibrosis release procedures, proprioceptive neuro facilitation, and manipulative procedures as needed to maintain global and inter segmental motion improvements obtained during the MUA procedure. Begin home rehabilitation exercises 2-3 times per week. Continue full protocol (fibrosis release procedures, proprioceptive neuro facilitation and manipulative procedures). Patient treated 1-2 times per week for 4-5 weeks depending on patient needs. Active progressive resistive strength/stabilization exercises, supervised/unsupervised 2-3 times per week; optimal rehabilitative procedures should include attention to aerobic, flexibility, strength, and coordination considerations.